My adviser at Dickerson U has been pushing me to declare a major. I'm only a sophomore, but all of the different majors have different requirements for graduation, so you have to choose sort of early. The problem is that to pick a major, I feel like I need to know what I want to be when I grow up ... and I just don't know. My mama always said I was so contrary I should be a lawyer. I know she was just needling me, but lately I've been thinking that maybe being a lawyer wouldn't be so bad. At the rate Mama and Aunt Tally are going, I could probably make a living just keeping them out of trouble. And, besides, I've gotten the opportunity to watch the judicial process in action (what with all the murders and such going on in Dalliance), and I think it's kind of interesting. So after my favorite English professor died (and, with her, my opportunity to work as her research assistant), I decided to add a new extracurricular activity to my schedule: moot court! Every year, there's a new case that involves at least two constitutional issues. Competitors learn all about the law in those areas and prepare legal arguments about how the case should come out. In competitions, you present your arguments to a panel of judges (who are sometimes real judges, but sometimes they're lawyers, law students, and the like). They bombard you with questions the whole time, making sure you know all about the law and can think on your feet. You have to be prepared to argue both sides of your issue, so you have to be flexible. It's actually a lot of fun. The only problem is that, well, I sometimes get a little prickly when a judge asks me a question in a snarky tone. I don't take kindly to being talked down to. I'm working on keeping my game face, even when the judge is a jerk. It's been hard balancing school with my job at Remember the A-la-mode, practice, friends, and travel for competitions. To make things more complicated, my partner (who argues cases with me) is a boy. Kinda cute. Kyle's jealous. I keep telling him that David is just a friend, but you know how boys are. Still, despite the extra time and the drama, I think it's worth it. That's what I'm doing right now: competing at Baylor Law School. Mama's so proud she could spit. She takes pictures of me in my suit all the time, and she's basically telling people I'm already a Supreme Court Justice or something. But as much as I'm enjoying moot court, I'm not sure I'm cut out for life as a lawyer. I don't know if I want to wear suits every day or have to be nice to snarky judges. Maybe I would be a good teacher (except that I'm not very patient). Or a doctor (except I don't really like to be around sick people). Or a psychologist (except I deal with enough crazy just sitting around the dinner table). How am I ever going to choose? How did you decide what you wanted to be when you grew up? Or are you still deciding? 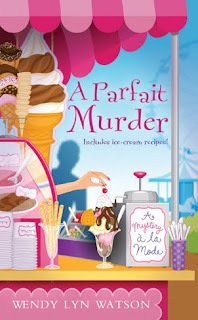 Read all about Alice's adventures in I Scream, You Scream, Scoop to Kill, and A Parfait Murder. And be sure to visit Wendy on her website and on Facebook. Also, look for Wendy's new alter ego, Annie Knox. I always wanted to be a writer. Working in finance, I couldn't help writing murder mysteries. My inspiration came from a English teacher. In grade 8. He said I could write & I believed him. I've taken a few detours along the way but always come back. That makes it a fun journey. Just remember, whatever you choose doesn't need to be for life. Erika is right, the detours make for an interesting journey! You know, Alice, you could be a snarky judge. Imagine how many pictures your mother would take of you in your robes! I always knew I would work with numbers but it wasn't until I took a sociology course and discovered consumer research, that I knew what I wanted to do. Well, I've worked at a lot of things, none of them as a career with a title: while parenting, from academia to business (high tech) to the legal environment (including PR, politics, & science) and a running nonprofit. I'd say it's best to stay curious, be trainable, & mostly adaptable thus ready for whatever interesting opportunity happens next.